Good morning and thanks for stopping by Everything Outer Banks to check out Memory Monday. Each week we provide you photo memories of our guests and they are always great. Some would call them Stellar. That takes us to our title this week as these pictures were brought to us by Kelly Stolar so we have named this week’s blog “Stolar Memories.” Get it? Indeed Kelly stayed with Outer Banks Blue a few weeks ago and had a great time as you can see from these shots. On the list of activities for the Stolar family included walking the dogs on the beach. Keep in mind Outer Banks Blue has more than 50 vacation rental properties that accept dogs at no extra charge. There is also a shot of a ghost crab. No vacation is complete without a nightly hunt of these nocturnal creatures that burrow into the sand through holes they dig down deep into the sand. It is great fun taking a flashlight out to the beach at night and chasing these fast movers around the sand. Many times these little guys will be seen running into the ocean. They do this to keep their lungs moist so they can breath properly, but an interesting fact is that the crabs will drown if they stay in the water too long. Unlike popular opinion these crabs cannot live in the water. There is also a shot of the Stolar famil in front of the Currituck Lighthouse taken at the Heritage Park in Corolla. That is a great day trip for someone to consider during their vacation. Lots of history to explore, and the climb up the lighthouse is spectacular. The final shot is from the entire group doing some stand up paddleboarding and kayaking. 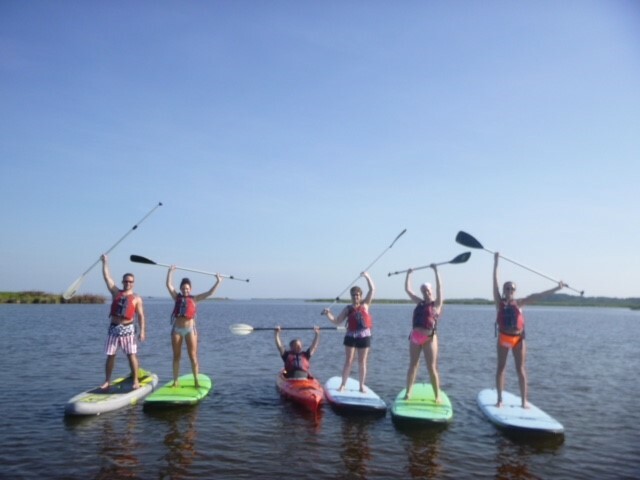 This activity (stand up paddleboarding) is taking the Outer Banks by storm and taking a tour of the west side of the Outer Banks is a wonderful family activity. Here’s a link to a company that offers this service to guests. Thanks Kelly for sending along your pictures for our Memory Monday. It sure looks like you all had a great time. We look forward to serving you again soon. Greetings from a still very windy OBX. We have experienced 4 straight days of heavy wind here on the beach, but the weather man promises today will be the last of it the wind for a while. Thank goodness as we are getting very tired of the heavy breeze we’ve seen for the last 5 days. We sure hope the weather man is correct because we can use some beach time. 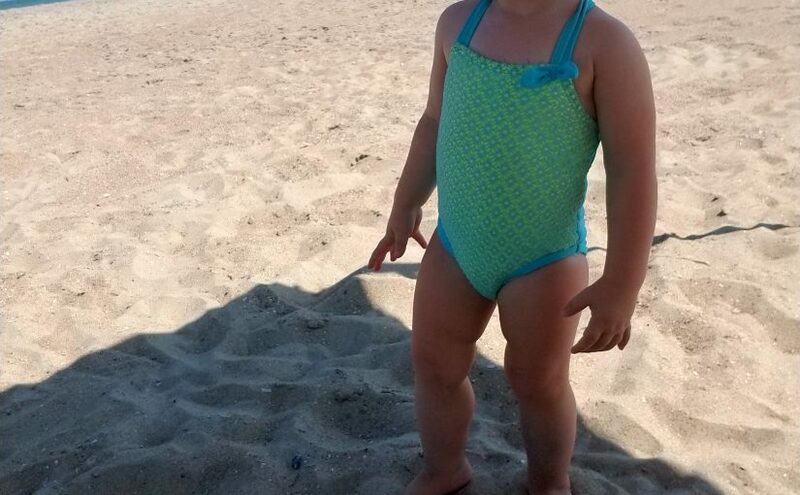 This week’s Memory Monday photo submission reminds us of how much fun the beach can be in a post we are calling Toddler rules. 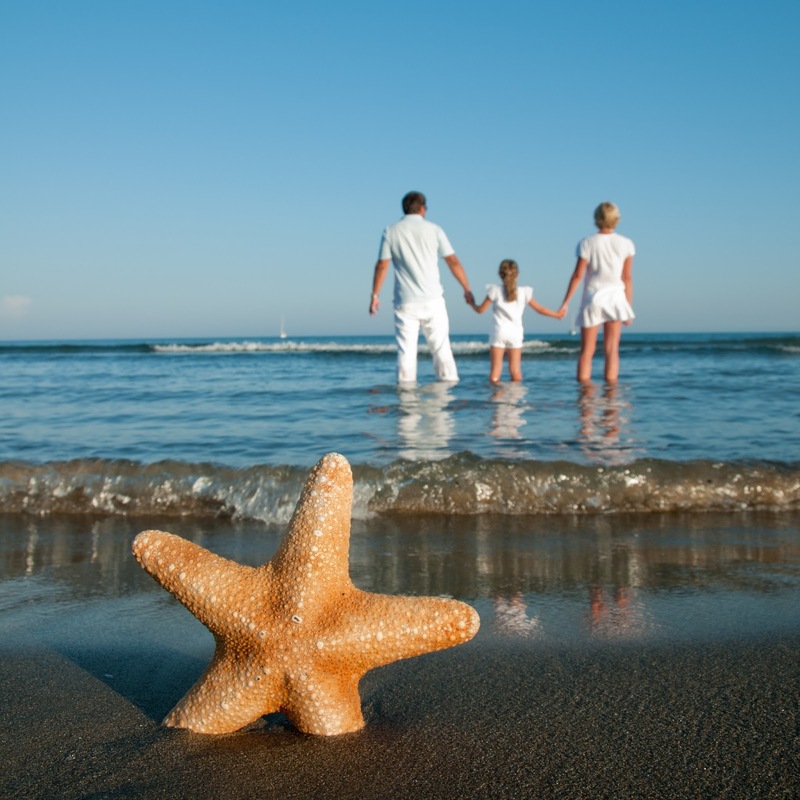 Whether it was hanging out with dad down by the waves…. Swinging with mom on the beach…. That looks like a fun time for this young lady. 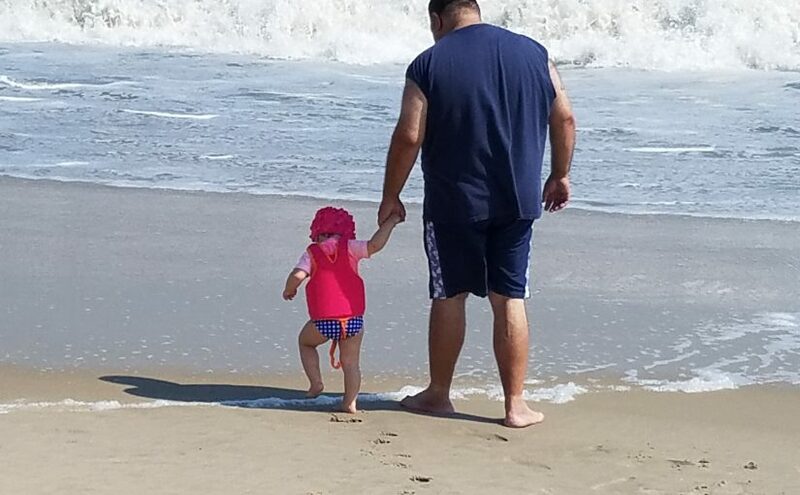 We love that she had such a good time and we love that you shared your photo memories with us on Everything Outer Banks. Keep in mind that you could see your photos posted here too. Simply send us your best photo memories of your stay with Blue and we post a new picture here every week. Then each month we randomly draw one of our monthly posts to receive a $100 discount on their next stay with Blue. We hope it is you! Thanks again Tosha for sharing your photo memories. We look forward to serving you and your family again soon. Water…Beach! : Memory Monday October 23, 2017. That pretty much says it all doesn’t it?! Thaks Jessica for sharing your photo memories with us. Cute Kid: Memory Monday September 18, 2017. Greetings from the Outer Banks on this Memory Monday. We start your Monday off with a cute kid on the beach this week. Keep a good thought for us this week as we all wait and watch anxiously for the passing of Hurricane Jose. Forecasts take the big boy storm off of our coast by a few hundred miles, but we are experiencing some clouds, breezy conditions and some off and on rain today. Enough weather to chase everyone off of the beach and for the red flags to be flying on the dunes today warning swimmers to stay out of the water. Let’s hoe this is as bad as it gets with regard to the weather this week. 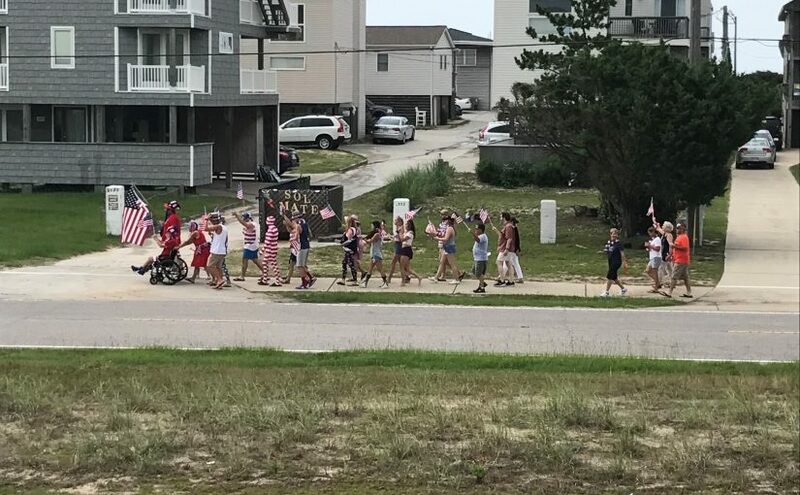 So for this week’s Memory Monday photo submission we give you a shot provided to us by one of guests that just stayed with us in the last couple of weeks at Outer Banks Blue. Here’s a picture of a cute kid getting ready for his big photo shoot. Beautiful beginnings: Memory Monday January 13, 2015. There is nothing like connecting with family on the Outer Banks, and this picture of these two embodies the connection that we all share with siblings in a relaxed atmosphere. Outer Banks Blue loves bringing families together. Thank you Kelsey for sharing your Outer Banks Blue vacation photo memories. Happy Birthday Marines! : Memory Monday November 10, 2014. Posted on October 22, 2013 Author Outer Banks BlueCategories UncategorizedTags beach weddings, Beachcomber's Paradise, Corolla vacation rentals, Currituck, Destination Travel, Family vacations, Fishing, Holiday vacations, Nags Head vacation rentals, north carolina, obx, Outer Banks Blue, Outer Banks Travel, Rainbow over the Outer banks. Back to school for many Outer Banks “Blue” kids! When you cross the state line headed to your vacation home, there are a lot of things to look at and absorb. Are you already contemplating your next visit? As you return home from the Outer Banks, what is the last thing you look at and remember all year while you wait to return? I lived not far from the Outer Banks in Chesapeake, VA until I was about Middle School age. Every summer we visited the OBX, if only for day trips to watch the waves crash and my mother’s biggest dream included living here. When I was 13, we packed up and moved across the state line. I fell in love with North Carolina schools and quickly made friends. I call this area my home, “where I=&1=&”. During my college days, I found a great job working my way through a local resort to become a Manager and later traveled to promote travel to the Outer Banks of NC. I landed a position with Outer Banks Blue and have been working in the Vacation Rental industry a combined total of over 14 years now! I have had the pleasure of touching the lives of many families, watching them learn and live the Outer Banks history, while making memories to last a lifetime! This position has been so fulfilling and I will take the memories of crossing the bridge and passing that Mile Post 1 sign with me to the grave. I now live in Camden, NC which is about an hour commute. I enjoy all of the sites along the way, especially counting the different state tags I pass along the way. I enjoy comparing statistics with the visitors on our website through analytic research with those that I meet & greet on the roads. It has been an honor to paint the pictures online using photography, videos & elusive descriptions of the vacation homes. Families unpack their lives in these home and it has been one of the most amazing experiences in a career. There are many shops, diners and stops you can make on your way to and from the Outer Banks year round, and we look forward to counting your tag as you pass by on your next visit!